The Atlanta Braves’ three aces may be the greatest pitching combination in history: the artist Greg Maddux, the stylist Tom Glavine, and the electric John Smoltz. In seven seasons, from 1993 through 1999, the Braves won almost two-thirds of the games started by their Big Three. Maddux claimed four straight Cy Young Awards, Glavine two Cys, and Smoltz one. Atlanta pitching coach Leo Mazzone said Smoltz “had the best stuff of all of them. Greatest slider I’ve ever seen from a right-handed pitcher. Powerful fastball. A nasty split-finger. A changeup. And a curveball.”1 Smoltz owed his 22-year career to a live arm, determination, and medical science. When the Braves won an unequaled 14 consecutive division championships from 1991 through 2005, Smoltz was the only player to celebrate every one.2 His election to the National Baseball Hall of Fame in 2015 came one year after Maddux and Glavine were inducted along with manager Bobby Cox. Smoltz is the only pitcher to record more than 200 victories and more than 150 saves, but that is a junk statistic; Dennis Eckersley totaled 197 victories to go with 390 saves. Smoltz’s unique achievement was his excellence as a starter, then a closer, then a starter again. He led the National League in wins at age 29, in saves at 35, and in wins at 39. Before all that, Johnny Smoltz was a good boy. John Andrew Smoltz was born on May 15, 1967, in Detroit but grew up in Lansing, Michigan, the eldest of three children of John Adam Smoltz and the former Mary Tersigni. His father, a salesman and a joker, embarrassed the children when he decorated his car to look like the calculators he was selling. Both parents moonlighted as accordion teachers. Johnny joined the family business when he was 4, playing at polka parties and winning prizes for musicianship. By age 7 he set a new goal. He told his mother he would be a professional baseball player. Fine, she said, but you should have a backup plan, just in case. Okay, the boy replied, I’ll be a gas-station attendant. Other teams were taking notice, and several scouts told Johnny he would likely be drafted in the first three rounds. His hometown school, Michigan State, had offered a baseball scholarship, so word got around that he might be difficult to sign. He fell to the 22nd round, when the Tigers claimed him with the 574th pick of the 1985 draft. At the time of his election, Smoltz was the lowest draft choice to make the Hall of Fame. Smoltz was not an immediate success in pro ball. Although he was promoted to Double A in his second season, his ERA for the Eastern League’s Glens Falls Tigers was 5.68 in August 1987, with a 4-10 record, when lightning struck. An infamous (in Detroit) trade with Atlanta brought the Tigers a veteran right-hander, Doyle Alexander, who went 9-0 as a two-month rental to help the club win the American League East championship. Smoltz was distraught, feeling rejected by his hometown team and dispatched to the depths of hell, or at least the National League. “As far as I was concerned, the Braves were the worst team in all of baseball.”9 He wasn’t far wrong; the club was bad and getting worse. The Braves did have something the Tigers did not: minor-league pitching coaches. Smoltz said the roving coaches in the Detroit system had given him little instruction, and the advice he had received was often contradictory. Joining Atlanta’s Triple-A club in Richmond, he began a 19-year collaboration with Leo Mazzone. Mazzone didn’t tamper with Smoltz’s mechanics, “one of the most beautiful deliveries I’d ever seen.”10 Instead, he concentrated on improving the youngster’s curve and slider. Improvement came quickly. Smoltz posted a 2.79 ERA at Richmond before Atlanta called him up in July 1988. The frightened 21-year-old made his debut for the last-place Braves against the first-place Mets. Shea Stadium was packed for Tom Seaver Day. Smoltz allowed only one run and four hits in eight innings before Bruce Sutter closed out the rookie’s first victory. He won just once more and finished with a 5.48 ERA, but the next year he made the All-Star team in his first full season. General manager Bobby Cox moved into the manager’s chair in midseason 1990 and John Schuerholz took over as GM. They added veteran third baseman Terry Pendleton and first baseman Sid Bream to a young nucleus of hitters including David Justice and Ron Gant. Clearly the Braves were getting better, but no one anticipated the magic of 1991. Smoltz almost didn’t make it for Atlanta’s worst-to-first surge. By the All-Star break he stood at 2-11 with a 5.16 ERA. His confidence had collapsed. “Anytime things started to get a little hairy, I would begin to unravel; ... it became a foregone conclusion in my mind that once runners were on, they were going to score.”12 In desperation, Schuerholz suggested he see a psychologist, Jack Llewellyn. Llewellyn calls himself a mental-development coach.13 After a few sessions with his new patient, Llewellyn gave him a video showing some of his best performances and told him to watch it before every start. “Remembering my little highlight reel helped me break out of it and banish the negative thoughts from my head,” Smoltz said.14 He went 12-2, 2.63 in the second half, then shut out Pittsburgh in the seventh game of the League Championship Series to send Atlanta to the World Series. That shutout established Smoltz’s reputation as a big-game pitcher. He went on to set postseason records with 15 victories (since surpassed by Andy Pettitte) and 199 strikeouts. But the biggest Game Seven of his life is known as the Jack Morris game, not the John Smoltz game. In the deciding contest of the 1991 World Series, Smoltz shut out the Minnesota Twins until he was relieved in the eighth. Morris, refusing to come out, pitched 10 scoreless innings for the victory that sealed the championship. That was the start of Atlanta’s run of 14 straight division titles and the first of many postseason letdowns. The club made it to the World Series five times but won just one championship. After another disappointment in the 1992 Series, Atlanta signed free agent right-hander Greg Maddux, that year’s Cy Young Award winner with the Cubs. He joined the 1991 Cy Young winner, Glavine, and Smoltz at the top of the rotation. The three maintained an intense, though unspoken, competition; nobody wanted to be left behind. Smoltz knew where he stood. “My sense is that I was the guy riding in the backseat most of the time,” he acknowledged. “As good as Greg was, Tom was right up there with him.”15 With the Big Three and a changing cast of supporting pitchers, Atlanta allowed the fewest runs in the National League for 11 straight seasons, 1992-2002. Even as he topped the league in strikeouts and starts in 1992, Smoltz began suffering elbow pain. Atlanta’s orthopedic surgeon had told him he had, in layman’s terms, extraordinarily loose joints. Smoltz thought his flexibility made him a better pitcher, but it also made him a pitching time bomb. By 1994 he had to shut down in July and underwent elbow surgery to remove a bone spur and chips shortly before the season was canceled because of the players’ strike. Smoltz capped the season with one of his best World Series performances. After beating the Yankees in Game One, he came back in the fifth game to strike out 10, allowing just four hits in eight innings. Only two Yankees reached third base, one of them after center fielder Marquis Grissom muffed a fly ball. That man scored an unearned run and Andy Petitte shut out the Braves for a 1-0 victory. Smoltz said it was the best game of his life, but added, “My arm, for the last seven innings, I ain’t lying, my arm was tired, hurting.”18 The Yankees won the Series to begin their own dominant run, claiming four championships in five years. The elbow gave out during spring training in 2000. Smoltz made the dreaded visit to the pitcher’s best friend, surgeon James Andrews, for an elbow ligament replacement that cost him the entire season. Returning in 2001, he managed just five starts before heading back to the DL. Along with Cox and Mazzone, Smoltz concluded that his elbow couldn’t stand up to pitching a full game every fifth day. The club sent him to the bullpen and by the end of the season he had taken over as the closer. He recorded 10 saves in 11 chances, then finished all three games of the Division Series as the Braves swept Houston. It was the last postseason series the Braves won; they lost the league championship to Arizona. Smoltz called the fall of 2001 the Offseason from Hell. With his contract expiring, the Braves told him they wanted him back, but only as a reliever. He balked. He had organized his life around a starting pitcher’s schedule, waking up early on his days off to take his children to school and play golf. When he tested free agency, at least half a dozen teams offered him a starting job. The Yankees put a reported $52 million on the table for four years. After agonizing and praying, Smoltz accepted a $30 million, three-year deal, with an option for a fourth year, to close for Atlanta. “I looked at the total picture,” he said. “Family, lifestyle, my charity and community work, financial, friends and family. And baseball.”22 He, his wife, Dyan, and their four children were settled in the community and he was leading a fundraising drive to build a new Christian school. Smoltz had won 159 games as a starter; now he was a reluctant reliever. His personality didn’t seem to fit the role. He was hyperactive and something of a control freak. Fellow reliever Mike Remlinger said, “If he’s awake, he’s full tilt. He’s like a 10-year-old.”23 He had to come to the ballpark every day and sit around for six hours waiting to learn whether he would pitch. Smoltz asserted control over his new environment by renovating Turner Field’s bullpen, paying to install air-conditioning and bringing a favorite recliner from home. In his second outing of 2002, Smoltz entered a tie game against the Mets in the ninth and was rocked for eight runs. For the rest of the season he was nearly automatic. He set a National League record with 55 saves (matched by Eric Gagne the next year) while blowing only four opportunities. In 2003 he was even more dominant, with his fastball clocked at 99 mph. He allowed just eight walks and eight earned runs in 64? innings for a 1.12 ERA, with 45 saves in 49 opportunities. He saved 44 more in 2004. In 3½ years, Smoltz racked up a 91 percent success rate closing games. But he had to visit Dr. Andrews again after the 2004 season to clean out more chips in his battered elbow. Smoltz had accepted the bullpen assignment to preserve his elbow, but he eventually concluded that closing was more dangerous than starting because he was throwing all-out all the time. With Smoltz owning the ninth inning, the Braves had won four more division titles but never advanced past the first round of the playoffs. The Ted Turner era in Atlanta had ended and the new owner, Time Warner, squeezed the club’s budget. Glavine and Maddux had left as free agents because the team couldn’t afford them. Smoltz believed he could contribute more as a starter. Now he had to convince GM John Schuerholz. It was a gamble at long odds on a pitcher who was nearly 38 years old with an elbow that belonged in a medical textbook. On Opening Day in 2005 Smoltz made his first start in almost four years. The Florida Marlins knocked him out in the second inning after he gave up seven runs. Schuerholz’s bet looked like a loser. Five days later Smoltz struck out 15 Mets, matching his career high, and held them scoreless for 7? innings before he served up a two-run homer. Pedro Martinez pitched a two-hitter to beat him. Smoltz took his place at the top of the Braves rotation, leading the team with 33 starts, 229? innings, and a 1.145 WHIP. He finished 14-7, 3.06. The elbow held up, but he developed pain in his shoulder. He won Game Two of the Division Series against Houston on “pure grit,” Schuerholz said.25 It was the Braves’ only postseason victory as their run of division championships finally ended. Smoltz tied for the NL lead with 16 wins in 2006, followed by 14 the next year. On May 24, 2007, he recorded his 200th career victory when he defeated the Mets. Losing pitcher: Tom Glavine. But shoulder pain sent Smoltz to the disabled list two months later. He opened the 2008 season taking a shot of Novocaine before every start. When he could no longer pitch through the pain, he underwent arthroscopic surgery in June. Unacceptable or not, it was a fact. Smoltz signed with the Boston Red Sox, even though he wouldn’t be able to pitch until June. He interrupted his minor-league rehab stint to get married. He and his first wife had divorced in 2007. His new bride, Kathryn Darden, was a divorcee with two children. Smoltz joined the Red Sox rotation on June 25. He labored through eight starts, most of them ugly, before Boston released him and his 8.33 ERA. He still refused to quit. The St. Louis Cardinals were willing to give him a shot. In his first start for St. Louis he struck out seven in a row and shut out San Diego for five innings. That was his only victory for the Cardinals, but he pitched well enough to earn a spot on the postseason roster. Relieving in Game Three of the Division Series, he struck out five straight Dodgers in two innings. The Cardinals did not invite Smoltz back for 2010. He began a new career as a broadcaster with TBS, the television home of the Braves. Later he joined MLB Network as a studio and game analyst. He appeared at ease in front of cameras and brought an endless supply of corny jokes. (San Francisco’s Candlestick Park was so cold because “there was a Giant fan in every seat.”)27 Still craving competition, Smoltz looked forward to joining the PGA’s Champions Tour for senior golfers. Glavine, Tom, with Nick Cafardo. None but the Braves (New York: HarperCollins, 1996). Lopez, Javy, with Gary Caruso. Behind the Plate: A Catcher’s View of the Braves Dynasty (Chicago: Triumph Books, 2012). 1 Leo Mazzone and Scott Freeman, Leo Mazzone’s Tales from the Mound (Champaign, Illinois: Sports Publishing, 2006), 40. 2 The Braves finished second behind Montreal in the strike-shortened 1994 season, when no division champion was crowned. 3 John Smoltz, speech at West Georgia Technical School, Newnan, Georgia. youtube.com/watch?v=UfhuG-uKtJo, accessed February 28, 2015. 5 Mark Bowman, “Scouts thrilled they followed tip on Smoltz,” mlb.com, January 6, 2015. m.braves.mlb.com/news/article/105722168/scouts-thrilled-they-followed-tip-on-john-smoltz, accessed June 11, 2015. 6 John Smoltz with Don Yeager, Starting and Closing: Perseverance, Faith, and One More Year (New York: William Morrow, 2012), 47. 7 Bill Shanks, Scout’s Honor: The Bravest Way to Build a Winning Team (New York: Sterling & Ross, 2005), 130. 8 Gerry Fraley, “Braves’ Alexander Traded to Detroit for Minor Leaguer,” Atlanta Journal-Constitution, August 13, 1987: C-1. 12 Smoltz, Starting and Closing, 235. 14 Smoltz, Starting and Closing, 237-238. 15 John Feinstein, Living on the Black (New York: Little, Brown, 2008), 68. 16 Lindsay Berra, “Off the Diamond, Onto the Fairway,” Sports on Earth, May 10, 2015. sportsonearth.com/article/123152242/mlb-players-golf-us-open-john-smoltz-livan-hernandez-chris-sabo-garry-templeton. 18 Detroit Free Press, April 30, 1997: 4-E.
19 Smoltz, Starting and Closing, 70. 20 Michael Knisley, “The Unnatural,” The Sporting News, August 30, 1999: 13. 21 Smoltz press conference, Atlanta, January 6, 2015. accessatlanta.com/videos/news/raw-video-john-smoltz-speaks-on-hall-of-fame/vC9CWn/, accessed June 11, 2015. 23 Tom Verducci, “Atlanta’s Endgame Anchored by the Reluctant Closer, John Smoltz,” Sports Illustrated, August 19, 2001, online archive. 24 Hal Bodley, “Smoltz’s unique resume paved way to HOF,” mlb.com, January 7, 2015. m.braves.mlb.com/news/article/105863000/hal-bodley-john-smoltzs-unique-resume-paved-way-to-hall-of-fame accessed June 11, 2015. 25 John Schuerholz with Larry Guest, Built to Win (New York: Warner Books, 2006), 188. 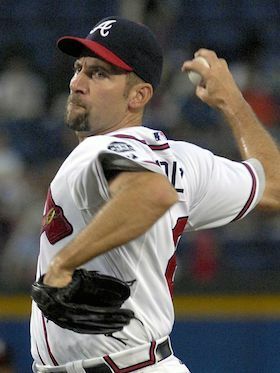 26 Jeff Schultz, “Smoltz Leaves Braves,” Atlanta Journal-Constitution, January 9, 2009: D-1. 27 “MLB Central,” MLB Network, June 12, 2015.